Following the latest and first Live Twitch stream by Hamish Bode and company (community developer @hamishbode for The Division) there’s some great news, especially for those that critiqued the Alpha a fair bit. Here are the highlights of their first, Live Stream/Cast. Finally, we have some dates and some extra information on what to expect within the beta. 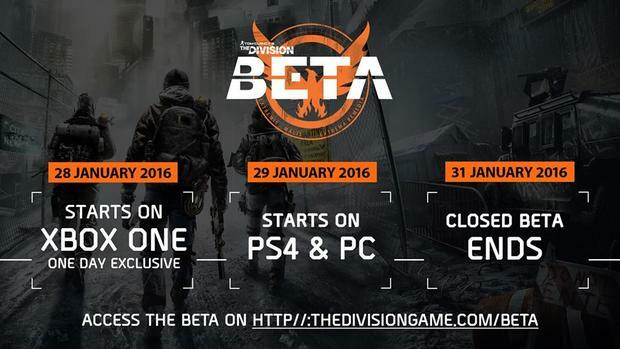 Anyone on the Xbox can access the beta on the 28th January while other platform will have to wait an additional 24 hours. Preloading will be accessible another 48 hours before that, so what ever platform you’re playing, check your download ability from the 26th. But what are we going to expect? Well, a popular announcement for all those streamers or Youtubers is that there will be NO NDA in place, so if you’re like me, you have complete freedom in streaming and recording everything you do. This is also great for those who are still on the fence about purchasing the game, being able to get the truest view of what the release will be like. Community Events is no surprise but for it to be confirmed suggests bosses that will be incredibly challenging either for closed squads or multiples of. I expect lots of death with these and hope that they scale with members included ensuring the fights are truly epic. Similarly, there are Landmarks which seem to be the expected farming locations for loot, resources and xp, but don’t expect it to be a walk in the park – unless it is in a park of course. One of the biggest criticisms of those that got hands on with the Alpha in early December was the stability of the servers. For any MMO-style game, this can be the most frustrating thing to happen and if you’re particularly unlucky, cause disconnects at times such as, for example, nearing a boss kill or as an exotic drops before you in the Dead Zone. Part of this was explained in that additional alpha players were being invited to stress the servers, but they ended up inviting a few too many causing connection problems for all. The news of dedicated servers should mean that connection problems were merely an alpha issue and had the chat going nuts! Hamish asked the pro question about the different playstyles people have and that the current community either preferred pistols OR AR/Snipers. This prompted the question about how shotguns would fit in and how well they would work considering damage mitigation for players revolve around cover; and getting up-close and personal would leave a minimal amount between Mr Angry Cleaner’s flamethrower and your face. This meant that, during the alpha, there weren’t many people using the shotgun. I for one am a shotty lover – just as long as it’s balanced! *looks at Destiny* – and mentioned by Hamish at 22:50 on the podcast link below. Happy Days. We’ve had games in the past say that “they’re listening” but it seems like the speed at which the team have responded on two of the most requested changes have been made in a pretty quick turnaround, even if they are minor. The first of these is proximity chat, turning on the ability to openly talk to other players within a certain proximity to yourself. Communication in social hubs is big part of any mmo game (it is, so let’s just call it that from now) and this will enable role-playing, squad building and general tomfoolery between clans or harassing strangers in these hubs. The second of these was the weapon switching making it quicker to switch (single or double-tapping Y on Xbox) to keep the fluidity of combat at its’ best. Just a little reach out to all those playing, really looking at getting some videos and streaming on the go both during beta and beyond. So if you are an experienced streamer/youtube person and fancy some pro dialogue and critical thinking around the game – as well as some Dark Zone owning – I’d be happy and grateful for anyone able to assist. There’s a lot more coming out over the next week and I’ll be back with the latest.